As soon as I came to the Loire, back from my trip in Israel, I rode to the old farm lady who makes goat cheese from only two goats (remember this goat-cheese story on Wineterroirs), with the idea to visit her and buy a couple of goat cheeses. As I was parking the bike in front of the farm, I could see her in the far coming in my direction as she was coming back from the field with her two goats (picture]. Alas she hadn't any goat cheese left that day and I stopped at another goat-cheese farm that I have never reported on until now (could come up one of these days) and bought one of their raw-milk goat cheese. I had it that same evening with a bottle of Sauvignon that I had just bought in bulk to André Fouassier for 1,5 Euro a liter and bottled myself. Unfiltered wine (you can really see it), without the usual sulphur-addings of the bottling. The sticker I wrote on the bottle neck says Fouassier A. 08, vif (means vivid) because I bought him Sauvignon from two different vats, one being more rich (gras) and the other being more fresh and vivid. The cheese was a 8-day cheese, at the beginning of its elevage, already a bit refined and dry but not yet very expressive in terms of aroma strength. I paid 2,2 Euro for it. It was 8pm when I took the cheese and the bottle out to the garden, but still so hot with the sun, and I had to find a shadowy place near the hedge and the cloth line to enjoy this treat. Being back home is one of the pleasures of travelling, you digest your experiences and put them in balance with your home surroundings, it's so different. On my way to the Loire (on the motorcycle), I rode part of the way on the Nationale 20 behind three guys on Harleys (actually, I saw later that there was a woman biker among them). Great experience, the sound and everything... Two of them had license plates ending with 34 (34 is the administrative number of Herault, a departement in the southern France) and the 3rd had British license plates. The way they were riding together had an Easy Rider feel, I just missed the music, this was a great thundering experience... It gave me the will to try one of those machines one day, but I wonder if they're reliable (I'm not a mechanic and hate having to fix my machine). When I saw this picture in Aujourd'hui, a major French newspaper and national version of le Parisien (a popular large-distribution daily), I couldn't believe my eyes : I kept thinking, I must be wrong, don't tell me they wiped away Clint Eastwood's cigar on this picture...they did ! Compare with another picture shot in the same scene [pic on right] as I didn't find the base picture on which this poor doctoring was done. How can they think we're so ignorant about Sergio Leone's movies and Clint Eastwood having a cigar in his teeth on this particular shot ??? Is a cigar an offensive scene ? Are we going to hide or photoshop all portraits even from long ago where people are seen smoking ? Same about wine ? Welcome back to France, the pre-sharia European country where you already can't have an ad glorifying the vertues and pleasures of a simple glass of wine without being sued by whatever anti-alcohol lobby and victimization group preying for retribution money. Time to leave, buddies, now the media seems to be applying this weird self-censorship to be safe from hostile suits, relying to photoshoping cigars (or cigarettes) away from historic pictures, like it happens in Amadinejad's Iran (hide me this ankle and this neck !) and happened in the late Brejnev's Soviet Union. At the time of the USSR, they didn't use photoshop of course but excelled at doing the same directly on film negatives, wiping away bottles of wine and vodka from diner tables attended by dignitaries so as not to anger the deprived masses (even without photoshop they did a much better job than this lousy photoshoping btw). Anyway, spotting the same thing happening in your own country, a western country that you still considered as free is bewildering, especially that Le Parisien/Aujourd'hui is not the most politically-correct newspaper around. The reason behind this self-censorship maybe that Le Parisien was comdemned last year for articles about Champagne, after an obscure, subsidized anti-alcohol group (ANPAA) sued and found complacent judges to impose heavy fines on the newspaper for "incitation to alcoholism" [sic]. Note by the way that this activist association (non-profit group) employs 1266 persons which are de-facto state employees (95% of its budget being financed by the tax payer) but are not counted as such in official statistics. And there are dozens such activist organizations in France, a country where the number of state jobs is already one of the highest in the world (wonder why the economy is faltering in France ?)... Speaking of the suit against Le Parisien for this article on Champagne, Molière would have loved this story for sure (you know the famous line from Tartuffe "cachez ce sein que je ne saurais voir"...), but there could be political reasons behind that sentence, the French judges being often highly politicized, and if Libération or Le Monde had published the same article they might have been more lenient or drop the case right away. Whatever, it is possible that Le Parisien/Aujourd'hui might have decided in regard to that costly affair thay they won't take any chances again and chose to erase cigarettes along with wine glasses. __first : non-profit, subsidized anti-alcohol lobbies and victimization-groups who are preying for whatever easy case that passes by. In France, subsidies by the state are viewed as compulsory by many activist groups, and attempts to remove these subsidies are considered as a threat to freedom, that's why France ends up subsidizing them for ever in spite of the nuisance . __Second: irresponsible judges who give these lobbies and suing parties free hand at exorting money from people and harrassing companies. __And third : a French civil society at large which doesn't dare to speak out to defend its way of life against the two later who threaten their culture and way of life. If you want to check yourself, find a copy of the French daily Aujourd'hui en France, from saturday june 27 (this was a big-printing issue with the death of Mickael Jackson). This doctored picture of Clint Eastwood is on page 29. Hunting down the pigsHas the swine flu something to do with this tank of Anti-Cochon ? When I saw the packaging of this product, I thought that our chemical companies had suddenly got the Egyptian syndrome and decided to get rid of all our pigs because of the so-called swine flu. This determined farmer with his hunting gun seemed resolute to finish off his pigs, but there's something in the picture which was obviously décalé and ironic, and when I read the fine print I saw it wasn't a "kill them all" rallying cry [sigh of relief]. The 5-liter chemical is intended to help the farmers limit the ramblings of their pigs to avoid that they ruin everything in the farm yard. The back label says something like "efficient and secure, our products are professional products useable by the private individuals". Private individuals do indeed make a high use of useless chemicals in their garden, polluting what could be a haven for diversity and insects. Dinner in an atelierNothing had been scheduled that evening, we had just closed a two-day exhibition in the 93 suburb just north of Paris were B., I and about 10 other artistts exposed their work. B. had exposed several of her limited series of artisanal-made books featuring re-worked images and wrtiters' texts while I exposed a dozen of pictures from the decaying Soviet architecture in Russia. one of the participating artists invited us all to come at his nearby atelier-and-home also located in Seine-Saint-Denis, actually 5 minutes from the exhibition space on foot. The guy has converted an industrial building, with his workshop on the street level, keeping some living space for himself and his family (he has two children). Living a real bohemian lifestyle, his place shows absolutely no sign of gentrification, the courtyard is a real mess with things that he salvaged here or there for his art. He works all kind of materials beginning with metal and occasionally works on old cars, making them anew to make a living, a roof-less Citroën DS awaits for example in the coutyard some future remodeling. The artist is moving soon out of this place with his family, heading to a farm a couple hundred kilometers from Paris, he says about his leaving "there's a war going on around here, don't you know ? ", we didn't answer but we all know what he means, these nothern suburbs of Paris are indeed a war zone from where many French flee when they can afford to. white wine. Actually a bit corked I think, but it got my curiosity excited and it let itself drink. It's imported in France by Globus, an importer I remember having visited through one of their shops to buy a bottle. There's a Globus shop located 14 Avenue Claude Vellefaux 75010 in Paris where they sell a dozen different wines from Croatia, Serbia and Montenegro, in addition to meat products and other edibles. I went to this Globus shop thereafter to check again the wines and bout a couple of bottles. Here are potential wine countries where we could see nice thing coming up, even if today the wines reaching Globus are not really satisfying. The cheapest bottles go for 2,75 Euro in this shop, that is cheap indeed, even worryingly cheap, you wonder what sort of doctored crap will jump at you in the glass at that price. I just opened a bottled of Croatian white that I bought after this evening, a Posip Smokvica 2004 by Korculansko Vinogorje (paid 6,75 Euro for it), a woody white, pleasant for an aperitif on these hot days of june, a bit head breaker after 2 or 3 glasses to be frank but, well, let's keep an eye on this wines, they're in the unchartered territories of Europe, not even on the map but there are probably nice things made over there. Great sake from HokkaidoTwo visitors fro Japan had offered me this bottle of Sake before my trip to Israel, and I gave the bottle a long rest before opening it, waiting for the right opportunity. That was all we needed to open this chilled bottle and enjoy the sake in small cups also offered by my visitors. That was a delight, a delicate, silky sake with a perduring feel in the mouth. This Junmai Daiginjo sake has been made by the Takasago brewery in the middle of Hokkaido in northern Japan in february 2009, in Asahikawa. The Japanese who were present said the place was reknown for its sake. This brewery has a wide range of sake types that make you want to explore Hokkaido. Here is what you can read in John Gauntner's precious Sake-centered website about the Takasago brewery. Wines at 2 EuroAiling supermarkets are eager to have customers flock again to their stores in these recession times and wine sales are one of the ways. This one is dating a bit (spring 2009) but it illustrates the opportunities to get some bottles of secondary French Appellations at a discounted price. This ad was posted big-size inthe Paris Métro, making believe at first glance that there were 100 wines at 2 Euro a bottle. The fine print reads "starting at 2 Euro" and what is not indicated here is that you only have a handful of wines at this price, and that you need to take a 6-unit case to have the discount price. Well, these sales are still worth checking because if the wine has something to offer, buying 6 bottles is doable, especially at 2 or 3 Euro a bottle. I don't have the time to visit supermarkets when I'm in Paris and there's no Carrefour near where I'm staying on weekends in the Loire, so I actually missed this sale but I wanted to share the info because in these sort of special sales you can find interesting small wines from minor Appellations and regions (sort of, I really don't consider Faugères, Fitou or Picpoul de Pinet to be minor...;-)). The trick is to pinpoint a few bottles, buy them, taste them the same day, and buy what is worth the money. 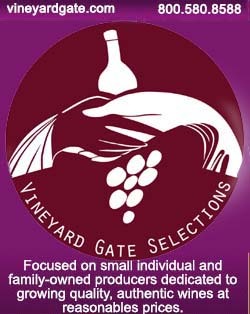 As I said in a previous post, the family wineries often sell a few thousand bottles at once to the supermarkets when they need cash and the big stores capitalize on that to put these discounted wines on the shelves. There were a few wines at 2 Euro a bottle (if you took a 6-bottle case), among which : a red Côte du Rhône “le Chemin des murettes” vieilles vignes 2007, bottled by Caves Saint Romain, a Négoce in Nîmes , at 2 Euro (if you took only 1 bottle : 3 Euro) with 17050 cases on sale throught France; a red Buzet (south-western France), Terres d’Albret 2001 at 2 Euro (otherwise 3 Euro) with 5100 cases, and a Bordeaux Chateau Marquis de Lapeyrade 2007 at 1,95 Euro with 95 900 bottles available (that’s mass bottling !). Alsace Sylvaner Bestheim 2007, 2,95 Euro (17 050 bottles); Picpoul de Pinet (Coteaux du Languedoc) Perline 2007, 3 Euro ( 14 750 bottles available); Côtes du Ventoux Domaine les Rouquettes 2007, 2,95 Euro (12 300 bottles); Fitou (Languedoc Domaine Cazals 2003, 2,9 Euro (11 050 bottles); Bordeaux Premières Côtes de Blaye, Chateau Haut Brignon 2007, 2,20 Euro, (9050 cases); Bourgogne Aligoté Domaine Bissey 2007, 3,5 Euro (13 000 bottles); Bordeaux Blanc (white) Chateau de Laborde 2007, 3,5 Euro ( 7500 bottles); Macon Jacques Delorme 2007, 3,3 Euro (9100 bottles); Minervois (Languedoc) Domaine Pech Viel “Cuvée Jugie Vieilles Vignes” 2005, 3,4 Euro ( 8900 bottles); Faugères (Languedoc) Mas Olivier “Grande Reserve” 2007, 3,9 Euro (21 700 bottles); Saint-Chinian (Languedoc) Col de la Serre 2007, 3,5 Euro (13 850 bottles); Chinon Domaine Eric Sourdais La Buscaudière Cuvée Préstige 2007, 3,5 Euro (10 050 bottles), Alscace Riesling Henri Ehrart Réserve Particulière 2007, 3,95 euro (16 850 bottles); Corbières les Ollieux Romanis 2006, 3,5 Euro (19 500 bottles – I missed this one, a “good” winery I think; Rosé Vin de Pays des coteaux d’Enserune (Cinsault), Augustin Florent 2008, 2,4 euro (8750 bottles); Bordeaux Lussac Saint-Emilion Chateau Verdu 2007, 3,83 Euro (5000 cases); Fronsac Chateau du Bergey 2006, 3,75 Euro (9650 bottles);Saumur Champigny Les Marnes 2007, 3,3 Euro (5150 cases). Rosé de Loire, Domaine de la Chenardière 2007, 2,9 Euro (9550 bottles); Rosé Coteaux d'Aix en Provence Moncigale, 1,97 Euro (53 100 bottles); Corse Rosé, Domaine Luccioni 2007, 3,95 Euro (8200 bottles); Bandol Rosé les Hauts de Seignol 2007, 6,8 Euro (8100 bottles); Rosé Cabernet d'Anjou (Loire) Domaine Delmaunay 2007, 3,35 Euro (12 500 bottles. A Loire Chardonnay 1992As said above, I dropped recently at André Fouassier's in Touraine to buy him 10 liters of Sauvignon in bulk. That's my favorite table wine these days, a fresh unfiltered Sauvignon that I bottle myself and can pour generously (I may not look like, but I'm struggling). I just called ahead at 7pm a saturday, he said no problem, I'm here. I drove to the winery with the Ami 8 with two 5-liter plastic jugs, and he offerred me to taste from a few vats, not only Sauvignons but Gamay, Pinot Noir and Côt, wines that weren't bottled yet. I ended up buying two different Sauvignons, 5 liters of a Sauvignon more on the freshness side, and 5 liters of Sauvignon on the richness side. At 1,5 Euro a liter, why would I need to look for wine-shop sales for my daily wine ? I discovered rehov Bugrashov while strolling randomly in Tel Aviv. It is a nice street with a San Francisco feel, up and downs and restaurants with terraces and shops. I found there what concentrates in a single location two interesting venues : a wine shop on the street level and a dancing bar in the basement. The first time I visited the place I thought naively that I would come back an evening and have a glass at the bar, but I didn't know yet about the dancing-bar culture of Tel Aviv, which transforms ordinary-looking bars into wild night spots. I came at maybe 10pm onze evening and from the top of the stairs I saw this crowd of twentiers dancing on Israeli hits, that was really an experience, except that with my camera bag and being alone I didn't see a point to staying, even less order a glass of wine. But I took note, Tel Aviv is a wild place to dance and have fun on almost any evening, and I'm surprised I didn't hear about it before flying to this country. I came back several days later an an earlier time and ordered a glass of Niederburg Chardonnay Reserve 2007 that I paid 34 Shekel. Nothing to say, not a memorable Chardonnay and again overpriced. The other thing on this place is that it's a regular wine shop with quite a good choice of bottles where you can buy your bottles and go or pay a 90-Shekel cork-fee (100 Shekel make about 18 Euro or 25 USD) and drink the wine downstairs at the bar. Quite expensive foe a cork fee, but well, it's a dancing bar in the evening...The up side is that this wine shop is open quite late. I am always shocked when I realize that someone I admire for his brilliance in one discipline can be a complete idiot in others. You French have a name for it, no? Idiot Savant? How can someone who is capable of understanding the complexity and subtlety of wine not see the monstrosity or Wal Mart? I guess if you are not well informed about something, you can always be on the wrong side of the fence. Perhaps you should write that piece about Wal Mart. If you did, you would have to do research on it, and that would in invariably inform you and make you be anti Wal Mart. Read about their anti labor rights history, or the way they have destroyed complete communities. In a very real way, they are the complete antithesis to good, natural, traditional wine. In fact, they are incompatible. I couldn't have said it better: "I am always shocked when I realize that someone I admire for his brilliance in one discipline can be a complete idiot in others. You French have a name for it, no? Idiot Savant? How can someone who is capable of understanding the complexity and subtlety of wine not see the monstrosity or Wal Mart?" What does it say about a person if they always have the former reaction, rather than the later? The wise people I know are not quick to harshly judge ideas they disagree with as idiotic, stupid, or evil. I think it is because the wise understand that the world is complex, everything involves trade offs and most things are not entirely good or bad. Further, it occurs to them that they could be wrong! In any case, Wake Up Wal-Mart is a campaign group affiliated with the United Food and Commercial Workers Union. Not surprisingly, the group is critical of Wal-Mart which, in addition to being the largest private employer in the United States, is also the largest grocer in the US. They are not an unbiased source of information, as the Union workers they represent work for companies in direct competition with Wal-Mart. In my judgment, one’s ultimate stance on this issue will not be an indication of idiocy or evilness. Some will obviously disagree. I think the problem here is that many debates have been hijacked by clanic-type behaviours : If you adhere to a particular vision of the world on a particular issue, you're obliged to take the whole pack of other issues and follow the same direction than what I would call "the new clergy", be it on Wal Mart or global warming, which I don't. Régis Debray, the French essayist who conceptualized this "new clergy" phenomenon, faced similarly harsh criticism for pointing to these politically-correct groups and refusing to fit in the pattern.